Some programs are unable to work with long file names. WinRAR is one of them. 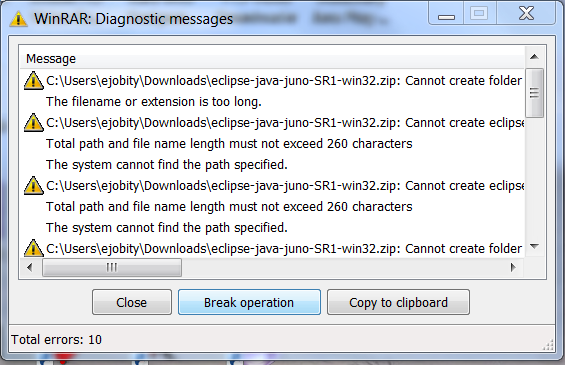 Because total path and file name length must not exceed 260 characters. Sometimes the file name is longer thus adding more characters to the extraction path. The reason is the extraction destination is a temporary folder that is too long. Basically a ZIP file is a compressed folder which consists of data that is suppressed at maximum. So when you try to unzip a file it is primarily stored in ‘Users’ folder and then is moved to the destination you have mentioned or a default destination of extraction. Software like WinRAR has set its location parameters in a way they to exceed 260 characters in length. That means: when the location distance exceeds more than the path specified – it shows error. But there is a decision – we can resolve this error by using PathTooLong application. Using various methods it allows to avoid errors with long paths. Just download PathTooLong and browse to the file. Now you are able to rename, replace or remove file with long path in easy way.